How often do I make a mistake or mess something up? Like smudge a brushstroke, drip paint on my finished painting, put the wrong herb in my stew or wear mismatched socks. Probably too often to count. The little things get brushed off as try again next time, or maybe there’s a way I can “fix it” or cover it up. The bigger ones, salt in the cookies instead of sugar, I pressed send instead of delete, I just have to own up and say I screwed up or I’m sorry. But how many times do I overlook an opportunity for something new that might be even better than I had planned? That color I thought was black is actually dark blue and I like it so much better! I can use that smudge on that perfectly clean white paper as a great starting point for my next painting. Basil instead of oregano gives this dish such an interesting flavor. I’m not a machine, I’m certainly not perfect. I will continue to make smudges, spills and goofs in and out of the studio. But what if some of them can lead to better things? I’d be happier and more relaxed and more creative. So in addition to my new year’s resolution to play more, I’m adding one (I make them all year round) to celebrate the oops moment. What mistakes have you made that turned out to be better than the original plan? Leave me a comment, I’d love to hear ! Sign up with your email address to receive future blogs and to keep up with what’s happening in my studio! Recently, I took a trip to Iceland with my husband. I brought a sketchbook and some drawing tools and small tubes of paint. I didn’t think I’d paint every day but maybe a few. Not one. Partly because we came back exhausted from our tours around the island and walking around Reykjavik but also due to sensory overload. From the bracing cold to the whipping wind that was so strong at times that you could barely stand then, a few feet away, no wind at all, Icelandic, an ancient language new to my ears and snow. So much pristine, white snow (as a New Yorker, I’m not used to lots of white snow). All so much to absorb. But what colors? I thought I’d be drawn to paint with the soothing blue of the Blue Lagoon against the black volcanic rock. We saw a lot of jagged black rock against pure white snow all over the island. A few weeks after returning home, without planning, I painted a face. Who knows what else is ruminating around my brain from that trip that may come out at unexpected times. A craving for roast lamb? An urge to stand infront of a fan in freezing cold weather? Maybe I’ll never realize the connection. What about you? What effects have you noticed in your life or in your creative endeavors after a trip or other immersive experience? Leave a comment below. I’d love to hear about your experiences. Sign up with your email address to receive my blogs and updates on what I’m working on in the studio. Happy new year’s wishes have come and gone, resolutions made, declared. The last New Year’s resolution I made and kept was about 10 years ago I resolved to make no more resolutions. I have kept it so far. Until now. A few weeks ago, around the holidays, I began thinking about what was missing in my life (not a whole lot, I’m supremely happy and satisfied with my life now) and my art. And I realized it was play. I need to play more. To let go of “should” and overthinking, let it all go and and just do what feels right. Sounds so 1970’s hippie-ish. Maybe I should join a commune. But sometimes just doing what feels right is exactly what is called for. I was doing a few small paintings yesterday, and thinking about what color to use and why, what shape to use and where to put it, should I put a line here, how long, scribbly or straight, maybe with a little smudge? They look ok but not great. I had some extra paint left over so I smeared it on some previously painted paper, maybe I can use it for collage later. Immediately I felt that wow feeling. It feels so different to create without trying, without the goal of making it look good. I can forget all of the “shoulds” and just do what I want at that moment. A big splash over that careful drawing? Bright orange that clashes with that teal? Why not if it doesn’t matter? That smear of extra paint painting had elements of joy, abandon and randomness which make a painting interesting . It felt like fun. Why is it hard to play? How can I bring that feeling into my art (and life) more often? I need to remind myself, to put my shoulders down and as the wonderful and wise Rebecca Schweiger says “It’s only paint!” So I am resolving to play more, do it just because it’s fun and allow my mind to expand and let loose more often. Please click on the menu on the left to see my most recent work. Leave a comment! I’d love to hear what you think about incorporating more play in your life! See video below for the essence of play! I just want to take this opportunity to wish all of you holiday season filled with happiness and joy. Here’s to a wondrous new year filled with many happinesses and successes. I am so excited to tell you of two upcoming shows that will include my work. The first is at the Atlantic Gallery in New York City. Three of my paintings will be in this show. The opening is November 29th and the show will run through December 22nd. My mother used to say “Doesn’t rain but it pours!” So it’s pouring a little bit. Another one of my paintings was juried into a show at Catalyst Gallery in Beacon, NY. Needless to say, I’m excited, nervous (OK, a tiny bit panicked) but overall happy to be sharing my art with the world! If you are in New York City or near Beacon , NY please stop by, I’d love to see you! Sign up with your email address to receive my blogs and newsletters. I respect your privacy and will not share your information with anyone without your consent. Last Fall Bill and I went apple picking at an orchard in Connecticut. I took a picture of these trees by the road because I liked the layers of color, green(s), yellow, orange. Layers of color is something I have been exploring more. An artist I am continuously inspired by is Joan Mitchell. 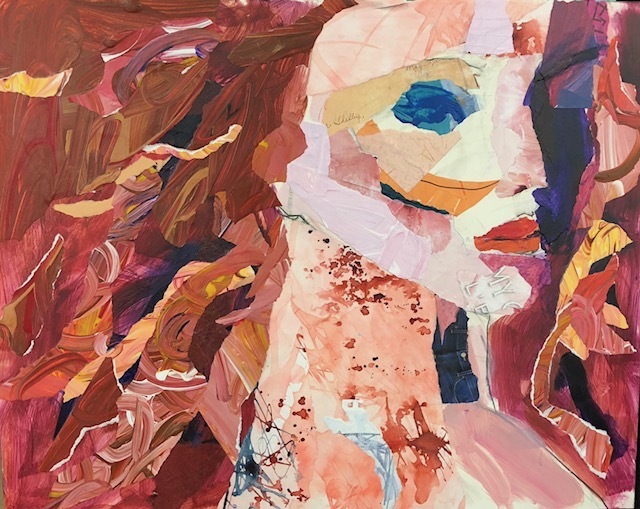 Her expressive use of color and the way she layers color to create depth. Without painting shapes to describe a leaf or a flower, you still know that you are looking at a field of sunflowers. I attempted to do something similar in the second painting. Using less detail, concentrating more on layers of color. It;s still difficult for me to totally leave the original image behind though. I'm still working on that. Click here to see the paintings on the website.